Department of Chemistry, Computational Quantum Chemistry Laboratory, University of Sistan and Baluchestan, Zahedan, Iran, P.O. Box 98135-674. 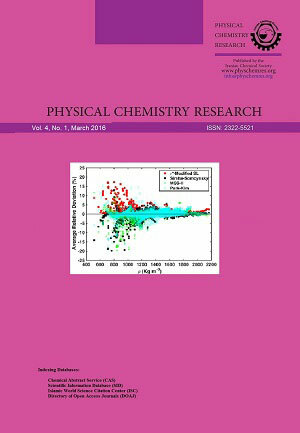 The effects of substituents on the symmetry and the nature of halogen bonds in [N∙∙∙X∙∙∙N]+-type systems are presented for the YC5H4N∙∙∙X∙∙∙NC5H5 (Y = NO2, CN, H, CH3, OCH3, OH, NH2, X = Cl, Br, I) complexes. Some structural parameters, energy data and electronic properties were explored with the density functional theory (DFT) calculations. In addition, electrostatic potentials were used in estimation of the strength and the nature of halogen bonds. Results indicate an enhancement effect of the electron-withdrawing substituents on the size of σ-hole and a diminishing effect on the minimum negative electrostatic potential (VS,min). 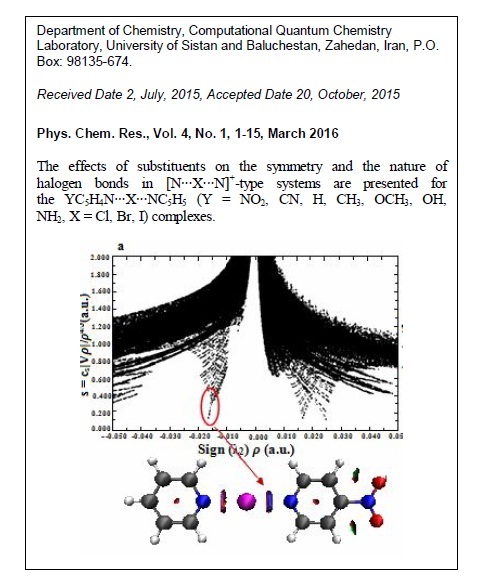 A good correlation is observed between the electrostatic potentials and the strengths of two N···X halogen bonds. Furthermore, the results unveiled the effects of the substituents in changing the nature of halogen bonds and indicated that the halogen bonds have a tremendous covalent character in addition to the electrostatic character that usually is considered for the halogen bonds.